Although the name “The Rock Island Plow Co.” is best known, that was actually the forth name for the company founded in 1855. The original name was “Buford & Tate Co” for its founders: Robert N. Tate, Charles Buford and son Basil (B.D.). To discuss Buford & Tate however, we also must follow John Deere’s History for the early years of both company’s were deeply entwined. The name Robert N. Tate is probably known to those familiar with John Deere’s history as Deere’s partner in the plow business when he moved to Moline. An Englishman by birth, Tate survived a shipwrecking and settled near Grand Detour, in the Dixon Illinois area in the 1840’s with his family. A farmer and blacksmith by training, Tate also was a poet and artist; trading his finer clothes before he would consider trading his books of poetry on his way west. A studious journal keeper, much of Tate’s life is documented in “The Man Behind The Plow: Robert N Tate, Early Partner of John Deere” by Connie Fairfield Ganz. After arriving in Illinois and spending time trying to make a living farming, Tate was hired to help install steam power in John Deere and his partner Leonard Andrus shop at Grand Detour. Impressed by Tate’s abilities, Deere hired Tate to work part time in his shop; and Tate, not faring well as a farmer, happily agreed despite the distance. As Deere’s partnership with Andrus strained in the late 40’s, Tate became a closer associate with Deere, although for a time he was also doing other projects. In 1848 Deere bought out Andrus (who would continue in the plow trade as the Grand Detour Plow company. The Grand Detour Plow Company continued until 1919 when it was purchased by the J.I. Case Company. The works would close in 1932 from the depression) which opened an opportunity to Tate. By this time, Tate had moved his family to Grand Detour. With the separation from Andrus in place, Deere was already thinking of moving from Grand Detour and offered Tate a partnership. With it all but given the railroad would pass Grand Detour by, the time was certainly right to make a move. Although their first inclination was to move south to Peru Il, its lack of timber made them uneasy. Although offered two lots by a local merchant to settle there, the pair decided to look elsewhere. A growing town named Moline on the banks of the mighty Mississippi in Rock Island County IL, only a few miles from the county seat of Rock Island was their next stop. Moline had an abundance of resources, and close access to the railroad and the river made it a natural shipping center to the west. Here too local business men sought to convince the pair to settle with mixed results. A lucky introduction from an old friend of Tate’s led them Col. John Buford of the Fergus & Buford foundry, who would be instrumental in convincing Deere & Tate to settle in fledgling Moline. Their foundry agreed to provide power from their dam and materials as an incentive, an enticing offer to a plow company. Besides the Foundry, Col John Buford also had opened the first store on the towns levee in 1839. His sons Napoleon Bonaparte Buford, James Monroe Buford and Thomas Jefferson Buford had subsequently expanded the store. With a location settled on, Tate and Deere as partners (officially dated June 19, 1848) opened their new factory, the Moline Plow Works. Although both were gifted salesmen and blacksmiths, it was soon apparent neither had a head for bookkeeping. John Gould, another Grand Detour merchant was brought in to handle the finances and the company became Deere, Tate & Gould. With Gould handling the finances, the company prospered and a couple of innovative marketing and bookkeeping practices were developed. Although Deere was given much of the credit for the production of their famous plow, it was Tate who oversaw much of the day to day operation of the plant. The company also was one of the first to pioneer the concept of the company store. By 1851 Deere & Tates, the partnership had soured. Although Deere and Tate remained friends, differences in philosophy and Tate’s annoyance at being the junior partner drove a wedge in the partnership. John Gould had also grown dissatisfied, lean budgets and difficulties on collecting debts had begun to wear on him. These differences led to the dissolution of Deere, Tate & Gould in 1852, and Tate would strike out on his own. 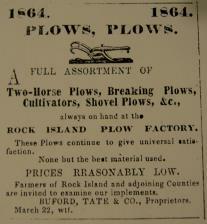 Moving slightly downriver Tate set up his own plow, seed drill and wagon business in Rock Island. Records are sketchy from the era, but evidence suggests that in parting, Deere and Tate had made an agreement not to compete against each other, instead each concentrating sales to certain areas according to Ganz. It appears Tate may have concentrated much of his sales on the new and growing California market. Tates advertisement in 1856 would say he employeed 6 and had manufactured $5000 in sales. This business lasted until an encounter in 1856 paved the way for a new business venture for Tate. An abolitionist, Charles Buford was a Yale educated wealthy Kentucky plantation owner who had followed his cousin Col. John Buford to Rock Island in 1854. An entrepreneur and real estate tycoon, Charles quickly became involved in many ventures including the mining of coal in what is now Coal Valley, IL as well as various real estate ventures around the area. A photo and history of Charles’ Rock Island House can be found HERE at the Rock Island Preservation Society. According to Tate, on Jan 12 1856, Charles and eldest son Basil (sometimes called Barret according to Tate, and at other times Basset in modern accounts) paid a visit to him to discuss matters of business. Tate makes no mention of knowing the Bufords at this time, but it is likely the may have at least know of them due to his past relationship with John Buford. Apparently, they had the notion to become involved in the manufacture of ag implements and with his father Charles arraigned a meeting with Tate. The meeting took place on the 26th at the Buford Brother’s store with Charles, Basil, Napolean Buford and Benjamin Harper (a friend of Tate and former mayor who also had an interest in Tates current shop). There an agreement was struck to form a partnership with Charles and Basil. At the time Basil, at age 20, was still considered a minor and so became a junior partner, with his dad signing the partnership as the senior partner and financier to the tune of $10,000, which they estimated as 2/3rds the start up cost. Tate immediately drew up plans for a factory that would compete directly with his old friend and partner, John Deere; to be based in Rock Island. Although Tate had little doubt Basil would be the principal partner in action, Charles took the lead at this meeting. With the partnership firmly in place, the company began building the factoy, which took most of 1856 under the name Buford & Tate. A newspaper article on Dec 10th announced the factory, saying it would employee 100 men and produce 200 - 250 plows per week. 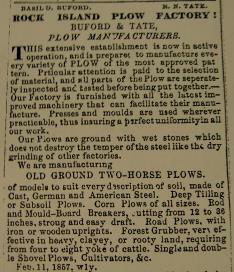 The Buford Brothers also became involved Buford & Tate and served as a major outlet for the sale of implements. Although Charles name appears as the official partner, he apparently had little to do with the actual company beyond some salesmanship, preferring to manage his other far reaching investments. Basil however, proved to be a good businessman, managing the company while Tate ran the shop and it was his name that appeared in the ads of the day. For the next decade, Buford & Tate would continue to grow, winning many awards for their products. At any given competition, it was likely they would share premiums with Deere. 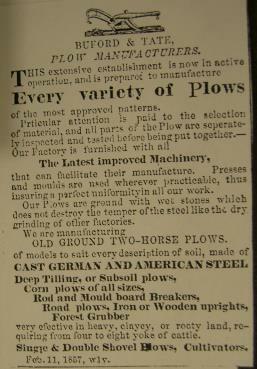 Besides plows, the company would produce a broad and diverse product line of implements, often being early innovators. Tate would remain out of the spotlight, but the Buford’s would be major forces in local politics. Although fierce competitors, Tate and Deere remained close friends and it was Deere who drove Tate and his daughter in Deere’s personnel carriage to the cemetery and home at the funeral of Tate’s wife Anna. Until the Deere’s disinterment and reburial in a family plot many years later, the Tate’s and Deere’s laid buried side by side. In later years, Tate and Deere remained friends , Tate even poking fun at Deere for mistaking a coconut for a pineapple on a trip the two took to Chicago according to his journal. Below: Rock Island Plow Company letterhead circa 1900’s and prior to 1910’s.